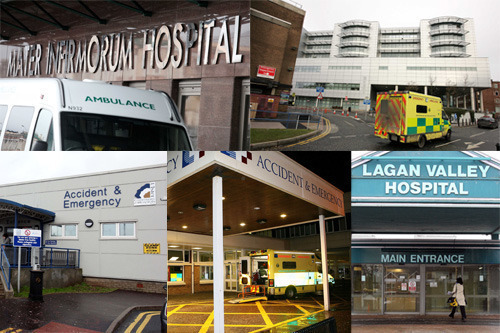 NORTHERN Ireland’s health trusts recorded over 30,000 incidents of physical assault on staff, patients and members of the public at Northern Ireland’s care settings over the past four years – but the task force set up to deal with the issue hasn’t met in over a year. Freedom of Information requests sent by The Detail to all five health and social care trusts show that since 2009 over 20,000 physical assaults were on members of staff while 10,000 incidents were directed at patients, clients, residents or visitors. The most recent figures for 2012/13 contain the highest incident rates over the past four years. The Zero Tolerance campaign was launched by former Health Minister Michael McGimpsey in 2007, it was designed to promote awareness around the problem of attacks on health and social care staff. However the figures obtained by The Detail show that the number of physical assaults on healthcare staff have actually increased since 2009. A ‘Zero Tolerance’ Campaign to protect health and social care staff from abuse and attacks was launched by the Department of Health in 2007. It involved organisations such as the PSNI, Health and Social Care Trusts, the British Medical Association (BMA) and Trade Unions. However, The Detail has learnt that the Zero Tolerance working group hasn’t met in over a year. A DHSSPS spokesman said: “The Minister is of the opinion that attacks on healthcare staff are totally unacceptable and remains committed to the Zero Tolerance policy. Zero Tolerance meetings were usually scheduled two or three times a year with the last one held in February 2012, as Zero Tolerance has been mainstreamed into trust responsibilities. The data shows that staff assaults totalled 5,581 in 2012/13 – compared to 5,281 in 2009/10. It is not clear from the figures provided by each of the health trusts who committed the assault in each case. We asked Sinn Fein’s Sue Ramsey, who is chair of Stormont’s health committee to comment on the figures. She said the Department of Health and the PSNI needed to be more pro-active in tackling the issue. She said: "We need to ensure that staff, patients and visitors are safe so I would have a concern that the working group hasn’t been meeting and I will raise this with the Minister. The Belfast Trust had the highest number of recorded assaults on staff over the four years (5,396), while the Southern Trust had the highest number of assault incidents on non-staff members 2,524. The Belfast Trust also provided a further breakdown of the type of assault that had taken place. A breakdown of The South Eastern Trust’s figures show that the number of overall physical assaults almost doubled since 2009. There were an extra 113 assaults not included in the overall total because the type of person assaulted was classified as unknown. The South Eastern Trust said it is “concerned at the increase in assaults”, but that it continues to enforce the Zero Tolerance Policy against abuse to staff or others. Over half (4,350) of the assaults in the Southern Trust were in hospitals and over three thousand (3,278) occurred in community setting. In a statement to The Detail the Southern Trust said its hospitals had porters on duty 24 hours a day who were “trained in dealing with violent and aggressive patients”. It said its staff were also trained in how to manage violent situations and how to request immediate assistance from porters or the PSNI if necessary. A further breakdown within the Southern Trust also outlined that there were 33 assaults of patients at home, half of these were in 2012/13 and over one hundred (109) assaults on staff were at patients’ homes. The Northern Trust recorded over 5,000 (5,293) physical assaults over four years. It was also able to provide a detailed breakdown of where the incident took place. The figures show that over two thousand (2,039) physical assaults took place at Holywell Hospital. Over 700 of these incidents (701) were on clients/patients/visitors and over one thousand (1,338) were on members of staff. There were also over four hundred assaults (449) at Antrim Area hospital. There were over four thousand assaults (4,377) in the Western Trust over four years. Three clients were assaulted in their own home, while 31 members of staff were assaulted in a client’s home.Over two thousand assaults (2,312) were in hospitals and the rest were (2,031) were in community facilities. In a statement to The Detail the Western Trust said it was concerned that patients or visitors to any of its facilities would experience any type of threatening behaviour. See the bottom of this story for the original data released under FOI by each of the health trusts. Responding to the figures, Dr Paul Darragh, chairman of the British Medical Assocation (BMA) in Northern Ireland, said that systems need to be put in place so that all healthcare organisations could share information on patients with a history of violence to help staff take the appropriate precautions to ensure their own safety. He said: “BMA(NI) has repeatedly highlighted the unacceptable levels of abuse that doctors and other health care colleagues face in the course of treating patients. There is a personal and financial cost of such attacks. “If doctors are injured, then they will be unable to treat the patient and will need to take time off to recover. This impacts directly on patient care and also costs the health service money, money that would be better spent on delivering care”.